The Habitat III Thematic Meeting on Metropolitan Areas opened this monring in Montreal with representatives attending from over 50 countries, 100 cities and nearly 200 organizations from around the world. The event will provide an opportunity to discuss the role of major urban areas and the importance of cooperation between them. The attendees will seek to adopt the Montreal Declaration on Metropolitan Areas, which will call for recognizing the importance of metropolitan action within the New Urban Agenda for the 21st Century, which will in turn be adopted in Habitat III, in Quito, in October 2016. For the past weeks, the Communaute metropolitaine de Montreal (CMM), the leading organizer of the event, and the Habitat III Secretariat, have circulated a draft Declaration for the purpose of gathering comments and suggestions online. An enhanced vision of this document will be presented and discussed at the Meeting. 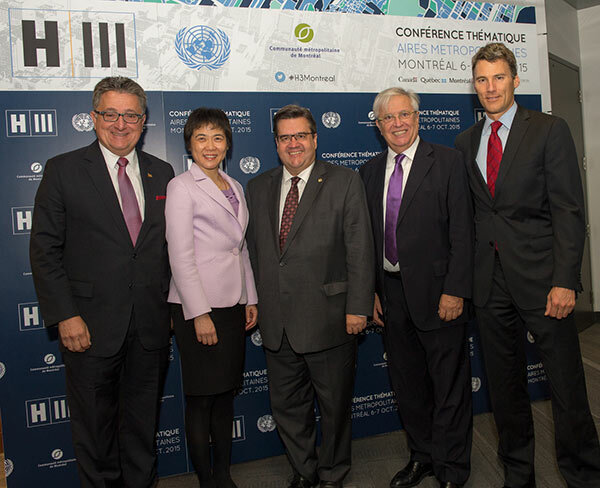 In the Opening Session, Mayor of Montreal, Mr Denis Coderre; Mayor of Vancouver, Mr Gregor Robertson; and, Secretary-General of Habitat III, Dr Joan Clos, emphasized the importance of recognizing metropolization in the New Urban Agenda. “Effective metropolitan governance is crucial for transformative development, considering social, political, economic and environmental impacts” Dr. Clos said. The Montreal meeting will be held today and tomorrow at the headquarters fo the International Civil Aviation Organization (ICAO).